Growing your email list isn’t easy. Dose it seem like no one is paying attention to you? 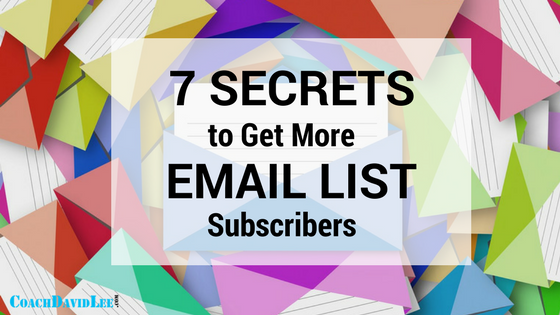 There are a few proven secrets the pros use that you can start doing now to get more email list subscribers. Above all, the focus should be on providing value to your visitors. It’s not about you growing your list. It’s about sharing your expertise and passion with your audience. Help them solve their problems. Answer their questions. Do this and you’ll have people WANTING to join your email list. This is one of the biggest things people miss. If you’re just asking people to “join my newsletter” or “sign up for my email list” that’s not nearly enough. Seriously, would you enter your email address? I wouldn’t. Also known as a “lead magnet,” this is probably the most popular way online marketers grow their email list. The key here is to solve a specific problem or answer a specific question. Above all: make it irresistible! Make your giveaway so irresistible that people would lose sleep if they DIDN’T get it. Your giveaway/freebie/lead magnet could be an eBook, cheat sheet, training video, access to an exclusive video series, free product samples, or maybe a free consultation. Whatever you decide, make it as specific as you can. Here’s one of my giveaways: a free training video on how to attract your dream customers online. If it’s some sort of download, you can ask for their email address so that you can send them the link to download the giveaway. Below are a two images of some email opt-in giveaways I like. Notice how they solve or answer specific issues. This is one of Chalene Johnson’s giveaways. She’s the creator of Beachbody’s TurboFire workout program. She’s also a badass online marketer. Notice how each bullet point in the image is specific, solves different problems and focuses on value. Here’s Ray Higdon’s main giveaway – 29 Sources to Get Leads Now. 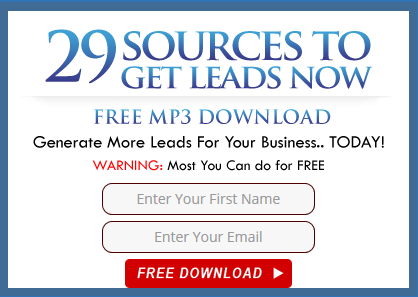 It’s an audio download that gives his audience 29 different places to find leads. He recognizes that finding leads is one of the top issues his audience has, so he’s offering a specific solution. Another big mistake a lot of people make is asking for too much info. Most people will be reluctant to even give you their email address, so don’t ask for anything more than their email and first name. That’s all you really need. In a lot of cases, all you need is their email address. Having their first name is good if you are going to personalize the email. So, try making their first name an optional field in your email opt-in form. In some cases, it might make sense to ask for their phone number, but that should be very rare. Make sure your email opt-in form is in a clear area. This might be on your home page or maybe on your sidebar. OR it might exist on its own landing page. The point is to make it easy for people to see your email opt-in. If you bury it on a page, don’t expect people to scroll down too far to find it. I have one of my opt-in forms at the top of my sidebar. Also pay attention to how your form looks on a phone or other mobile device. Just make sure the size adjusts to smaller screens or that it looks the same regardless of the screen people are using. You might want to experiment with placing an email opt-in form within a blog post as long as the content of the post is relevant to the opt-in form (which is the next point we’ll cover). You may also want to use a simple teaser image people can click that leads to a landing/lead capture page (EXAMPLE). A quick word about pop-ups: be careful not to overuse them. Google recently made changes knocking websites that use pop-ups that cover a significant portion of content, especially if they appear right when someone lands on the site. Even when using pop-ups, the rules on providing value still apply, perhaps even more. This should be a no-brainer, but can be easy to overlook. It doesn’t make any sense to try to entice people to join your email list or get your freebie if it in no way relates to the content of your website or blog. Again, you have to get SPECIFIC. Who are you trying to attract? What problems do they have that you can solve? What value can you bring them? The answers to these questions should not only dictate the content of your site, but also the whole point of why people should join your email list. If you’re trying to help moms lose weight and get fit while juggling a busy schedule with kids, then let them know your emails help busy moms solve those problems. Got it? Sweet. Let’s move on! This is a little trick you can play around with, but generally, make your “subscribe” button unique. Don’t just use the word “Subscribe” or “Enroll.” Boooooorrrring. Also, make your button changes colors when people mouse over it. This can depend on what service, tool or plug-in your using to create your email opt-in form, but it adds a level of interaction. 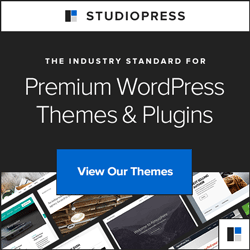 Whatever email marketing service you use (such as MailChimp, MailerLite, AWeber, etc. ), you likely have the option of setting up a welcome/confirmation email when someone opts into your email list. This could be the first emails sent in your email automation series. This could serve a couple purposes. First, you are asking them to confirm their intention of subscribing to your list (I highly recommend you do this). The welcome email also might include a link to download your giveaway. No matter how you use this welcome email, make sure that it’s sent as soon as someone opts in to your list. This is your first “handshake” with someone who’s just joined your list. Be conversational, welcoming, and keep it short. You also might let them know what to expect from you. If you’ll be sending a new, helpful email once a week, or for the next few days in a row, let them know that so they know what to look for. Great tips! This is something I’m working on improving, but still struggling to come up with my opt-in. Emily, what opt-in are you using? Great information. I agree with the notion of asking for ones phone number. There are several times I have closed a site because I felt the idea of one asking for my number was too intrusive. I also like the idea of making the button more irresistible. Yes, if there’s no reason for asking for it, then don’t ask for it! This is really useful for those growing their email list. Great advice and well-written post!